INgrooves acting against [even their own] authors on Youtube. On the jayropinsky Youtube channel we simply present our own music videos, from our own music. The very first one ever uploaded was “Girls United – Whom do you love?” in 2006, filmed and edited entirely by Storno in Berlin. Girls United were a mass improvisation band associated to kliklak.net, that existed for about 3 years at the time. Me and up to 11 fellow musicians had been committed to improvise pop music on the spot and to show, that this type of music can be invented every time you play. We played around 80 shows in 18 months, released an album digitally on a US label with ties to Sony Germany and then split up due to strong disagreements about an offer to take part in advertorials advertising Sony mobile phones. Humans. Some smelled money, others simply wanted to make music without such influence. However, this was a lot of fun and worked well for the time being. INgrooves had been allowed to monetarize our video by Youtube, Since when? Who are INgrooves at all?. We hadn’t been emailed or otehrwise informed by Youtube about any of this, but had to login to learn about a copyright complaint against our own material. The videos we supply on Youtube are free (and of ads) for everyone, music included. A lot of that material isn’t registered with copyright societies. Bandcamp releases might be the only source of the music otherwise. 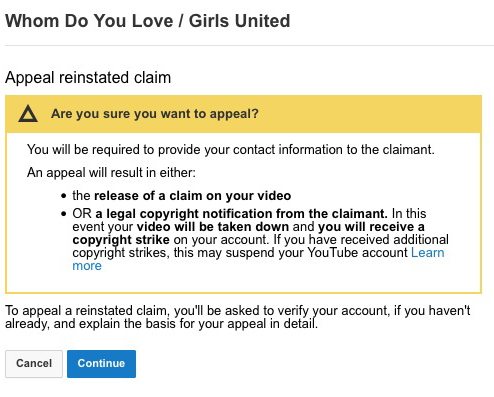 Then again, Girls United music got GEMA-registered, when it got released on dPulse Florida in 2008. But our video was up until now, and why should anyone complain about this freebie? Aha! Giggle. INgrooves owns my/our copyright now? Well, I am not reviewing my own dispute, am I? Absurd. Besides being confronted with automated idiocy i wanted to find out, what was behind all this. Girls United had a 2-year contract with dPulse Records at the time 2008-2010. They never sent any license statements or payments nor did they answer any email regarding this afterwards. And now, 4 years after the end of this contract it turns out, that our song is still in their online shops. Distributed by … AHA! INgrooves. This gets really funny now. Within an hour Youtube answers my dispute. Read. 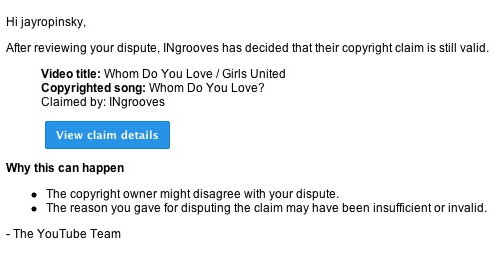 INgrooves has “decided”: I am disagreeing with my own dispute. Today is Easter friday, there could only be software in the office at INgrooves “leadership team” to “review” and “decide” quickly over a human culprit. Oh and: their monetization was turned back on. Automation is generous. 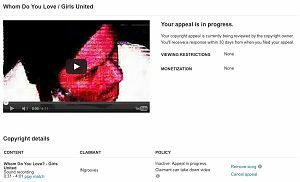 While staring at this i get a good tip from Girls United member Splatterdandy on a kind of copyright activist lawyer office in Berlin. With that possible (pitbull) force in my mind i am redisputing the reclaim with all details of the registered work. “Claimant can [now] take down video”* Fun stuff! But now at least automation has ended and they will have to send a real printed letter to me to address this. EDIT 2018: Their letter never arrived. At some point they switched the monetization off. If you’re an artist and got victimized by a similar and absurd incident like this, too, please comment below and mention it with all useful URLs. Let’s team up and laugh about those business idiots.